 Kick up red dirt on a motorbike ride to the far-flung corners of Phu Quoc Island.  See the sun set across the Gulf of Thailand from a Phu Quoc Island beach. 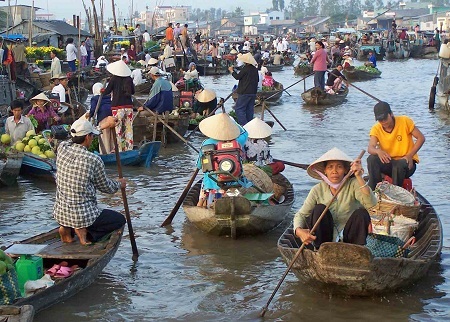  Join in the throngs amid the bustling commerce of the floating markets on a boat trip from Can Tho.  Meander along the canals between My Tho and Ben Tre, then step ashore a lush river island to feast on fresh fish.  Enjoy a forest of trees entirely full of storks at wonderful Bang Lang.  Get an experience of rural river life at one of the many homestays around Vinh Long. The Mekong Delta which used to be a part of the Khmer kingdom was the last region of modern-day Vietnam to be annexed and settled by the Vietnamese. Cambodians, mindful that they controlled the area until the 18th century, still known as the delta Kampuchea Krom, or ‘Lower Cambodia’. The Khmer Rouge tried to reclaim the area by raiding Vietnamese villages and killing their inhabitants. This provoked the Vietnamese army to invade Cambodia on 25 December 1978 and oust the Khmer Rouge from power. Ethnic Vietnamese is the majority of today’s inhabitants of the Mekong Delta, but significant populations of ethnic Chinese and Khmer, along with a smaller Cham community, also exist. As the government introduced collective farming to the delta in 1975, production fell rapidly and food shortages hit Saigon, although farmers in the delta easily grew enough to feed themselves. The Saigonese would head down to the delta to buy sacks of black-market rice, but to stop profiteering the police set up checkpoints and confiscated rice from anyone carrying more than 10kg. These things ended in 1986 and since then Vietnam has become one of the largest rice exporters all over the world. Most travellers visit the Mekong Delta on cheap and convenient organised tours. People who travel by theirselves will have greater access to little-visited areas off the beaten track. With the opening of several border crossings between Vietnam and Cambodia, consisting of the river border at Vinh Xuong (near Chau Doc) and the land border at Xa Xia (near Ha Tien), a lot of tourists are choosing these delta routes ahead of the original land crossing at Moc Bai–Bavet. Cambodian visas are available on arrival at all border crossings. Flights head from Hanoi to Can Tho and from Ho Chi Minh City (HCMC) to Rach Gia and Ca Mau. Phu Quoc Island’s new international airport welcomes flights from Hanoi, HCMC, Can Tho and Rach Gia. Some delta towns have ferry connections between them – an amazing way to travel. The journey between Ca Mau and Rach Gia is especially great. Boats to Phu Quoc Island depart from Rach Gia and Ha Tien. It’s surprisingly easy to travel the delta using public transport, and bus connections are excellent. Each urban centre has a bus station for both buses and minibuses – even though it’s usually located on the edge of town, requiring a short xe om (motorbike taxi) or taxi ride to your hotel. Minibuses are likely to be faster , moderately more convenient and not much more expensive. Departing from HCMC, delta buses leave from Mien Tay bus station, which is 10km west of the center. To avoid the slight inconvenience of reaching Mien Tay, you can book one of the cheap day tours to My Tho coming from Ð Pham Ngu Lao and abandoning the tour after the boat trip. Travellers can choose a flexible transport among private car, bicycle or motorbike. Two-wheeling around the delta is rather good, particularly along the maze of country roads and on Phu Quoc. Be prepared for toll roads and ferry crossings – though these are gradually being replaced with new bridges. Ferries are cheap and frequent. Dozens of tours head from HCMC to the Mekong Delta, either as day trips or longer jaunts. This is a great option if you’re short on time, but it means abdicating control over your itinerary and choice of hotels. The cheapest tours are sold around the Pham Ngu Lao area. Shop around before you book, but remember that you usually have what you pay for. This is not to say pricey tours are necessarily better, but sometimes ‘rock-bottom’ means a brief glance at the region from a packed bus full of other visitors. Rewarding motorbike and scooter tours of the Delta are run by Vietnam Vespa Adventure and Saigon Riders. Few people have had more of an impact on Vietnam tourism than Le Van Sinh, owner of Sinhbalo Adventures. What makes the Mekong Delta special? I have always been interested in waterways, as it is such a great way to take a rest – in a hammock, cruising along the river. All travellers ought to see the systems of canals and floating markets here because they are amazing and really different . Why cycle? Bikes are the most wonderful way to enjoy the scenery and get off the beaten track. If you want to cycle in the far north or even the central Highlands, you should have some experience and endurance, but for the pancake-flat Mekong, visitors can have a few days discovering on two wheels. It’s not important if you’re a serious cyclist or a city slicker; there are so many routes in the Mekong to enjoy and explore. Best routes? My favourite back roads include the small trail under the shade of coconut palms that runs from Ben Tre through Mo Cay and the pretty town of Tra Vinh to Can Tho. Most of the travellers only experience Hwy 1A on the way to Can Tho, but this is another world.